"Because a life can grow anywhere." Just Add Water is about Ray Tuckby, a small-town guy who is muddling through life in a dead-end town. He has fallen out of love with his wife and does not feel a strong bond with his son. Ray finds out that his wife has been cheating on him with his brother Mark for some time and that Ray's son is actually Mark's son. Due to this revelation, Ray decides that he has had enough of his family and wants to start his life over. However, more tragedy strikes Ray as his mother and sister die in a freak accident. During the accident, the two were fighting over a secret pie recipe. Ray finds out that he has inherited the pie recipe, along with his mother's fortune. Still distraught over the tragic recent events, Ray has no desire to spend the money and is not sure what new course to take in his life. With the help of a local gas station owner named Merl, Ray begins to find the right course to take. He starts by trying to win over his childhood love, Nora. The two quickly rekindle their old flame as Ray starts to believe he can have a brand-new life. Just as things are looking up for Ray, the local drug kingpin decides to wreak havoc on Ray's small town, threatening to take over the area to serve as his personal playground. Ray decides it is time to fight back and recruits many of the townspeople to help bring down the drug kingpin and restore order to the area. Through all of these events, Ray and Nora fall madly in love and decide to get married. Ray then takes the money he inherited from his mother and uses it to open a new restaurant, with her special pie recipe as the featured dish. Just Add Water conveys the message that it is never too late to start over and bridge a better path through life. 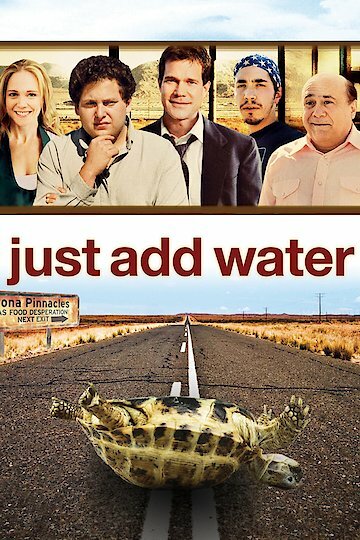 Just Add Water is currently available to watch free on Vudu Free and stream, download, buy on demand at Amazon, Vudu, Google Play, FandangoNow, iTunes, YouTube VOD online.